Assam, North-Eastern State in India is endowed with exceptional natural beauty. It is still not polluted due to industrial expansion. The state has large forests of Bamboo and teak and other trees. Tea is famous all over the world. You will see sprawling tea gardens for miles and miles. Bamboo is used for making many utility items. Traditional bamboo baskets that evolved through centuries of cultural and functional mediation are a response to a variety of local needs that were ingeniously satisfied by the local craftsmen. These include basket forms that are used for a variety of domestic, farming and fishing activities which are sold in the weekly markets in villages, towns and cities all over Assam. Large trays made from woven mats, structurally stabilized with stiff bamboo splits to form trays, are used for fishing and winnowing, drying, sorting and threshing grains. The fish basket has a wide mouth and narrow neck to prevent the fish from jumping out. Headgear and ceremonial rain shields are a response to the inclement monsoon that brings pouring rain for several months after summer. Rainfall is celebrated by the conversion of the everyday rain shields into a votive offering. The decorative jhappi is an appliqué embosomed rain shield symbolizing the harvest festival. Numerous other artifacts of farming communities are made from bamboo that include a bullock cart, grain storage bins, low stools, and a distinctive construction called the Assam type house found everywhere. Assamese craftsmen use simple tools such as a dao, bill hook knife, and jigs to shape their products although they are largely based on their visual judgment. The only exception to this rule is while making the jhappi, when a bamboo mould is used. Following are pictures of some of the artifacts made in Assam. 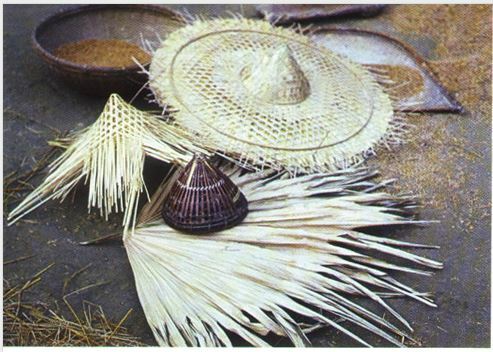 Below: A bamboo mould that is used for shaping the peak of the jhappi, palm leaf used for waterproofing and a semi-finished jhappi. 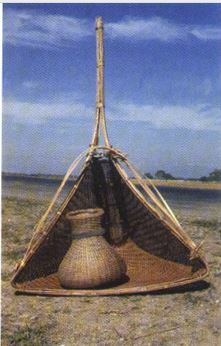 Below:Jhakoi, a fish trap with a basket for keeping fish, from Nalbari. The jhakoi is made by moulding a mat woven with bamboo splits. 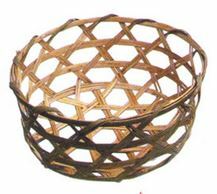 Below:Tray with open weave made from bamboo splits. It is used to catch fish living in the roots of the water hyacinth. 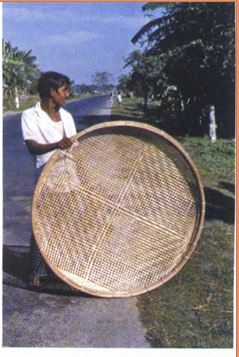 Below: A basket for carrying agri-produce, made in open hexagonal weave construction, from Silchar. Below: Muddah, a low stool, made in Silchar has a fascinating structure made of thin splits, tied together with cane bindings to form a warped surface that is load bearing. The seat uses split cane weaving. Below: Basket for keeping fish. The basket along with the large trays forms a part of the fishing equipment and is carried tied to the waist. 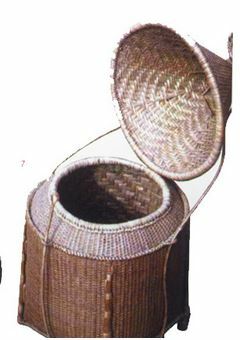 Below: Dimasa Cachari basket for storing valuable cloth. The double walled construction has an inner layer woven with coarser splits, and outer layer of smoother and finer splits. The conical lid is sturdy and hinged with braided bamboo straps. The samples of bamboo baskets are beautifully crafted. There is even and example of a basket for fishing in the hyacinths. That is good to know. Fishing lines and nets don’t work very well in hyacinths.